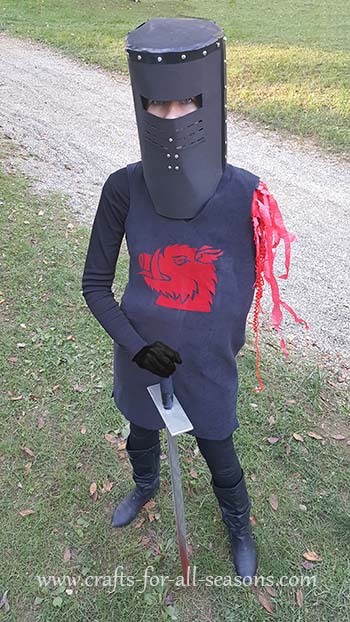 This year I went as the black knight from Monty Python and the Holy Grail. I even tucked in my arm in to became a one armed knight. I had so much fun playing this character! 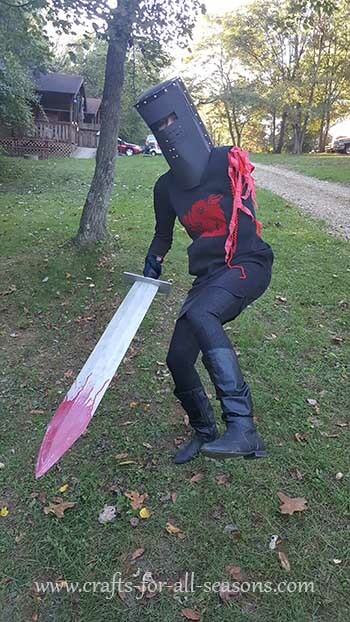 I jumped around, kicked, and waved my huge sword while quoting all the famous lines - "it's only a flesh wound!" Only a few knew who I was, but it was worth if for the true fans, who thought this costume was very funny! This costume won the Most Original at our annual Halloween costume contest. I'm a fan of the movie, obviously - and I always thought about trying to be this character. While watching the movie I realized the costume itself was pretty simple. The only thing I had to figure out was the helmet. My husband helped me out with making the wooden sword. I love the way the sword came out, but it is much bigger than what the black knight had in the movie. The helmet came out really nice, and it was made using three black FOAMIE sheets! Even when people saw me close up, they thought the helmet was made of metal. The FOAMIE sheets were so easy to work with, and it made the helmet incredibly light and comfortable to wear. 1. For the costume itself, you will need black leggings or tight pants, black boots, a black tunic dress or long fitted shirt (cut the sleeves off), and a long sleeved black shirt for underneath. Do not forget black gloves. The black knight also wore a belt, but I didn't think it looked right on my tunic, so I decided to skip the belt. 2. 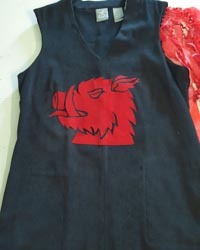 The Monty Python black knight had a red boar head on this tunic. 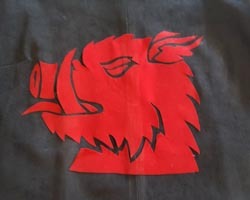 I found the boar image online (do a search for black knight red boar), enlarged the pattern to the correct size, printed it out, and used it as a pattern on red velvet. I cut our each piece and hot glued it to the front of the tunic. 3. I wanted to be able to tuck my arm in when I wanted, to be a one armed knight. To create the bloody shoulder, I cut off a piece of black duct tape, and along the sticky side I lined up some long pieces of red party streamers (crepe paper), red yarn, and red ribbon, to look like fake blood. 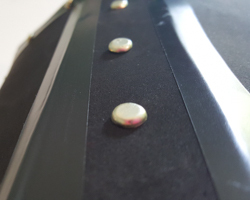 I applied this duct tape to inside of the shoulder cuff of the tunic. When I tucked my arm in, I had my husband tuck a red circle of velvet inside the arm hole while my arm was hiding across my stomach. 4. To create the helmet, I first created the entire helmet out of ordinary scrap paper. This way I could make sure I liked the size, it fit over my head correctly, and I had the eye holes cut correctly - before using the FOAMIE sheets. It took two FOAMIE sheets, to wrap around my head. I made sure the front and back of the helmet were one full sheet, as I didn't want any seams here. 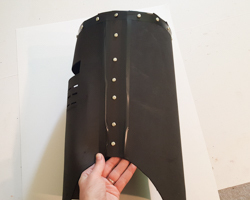 The sides of the helmet needed a little extra width, so I cut a one inch strip of FOAMIE on each side to add to the full length. These were attached to each other using a strip of black electrical tape. The top of the helmet was a round circle, but I cut "tabs" around the circle, so I had something to fold into the helmet and secured the tabs with black duct tape. I lined the top of the helmet with a strip of electrical tape. The eye holes and small breathing holes were cut easily using an Exacto knife. I used paper metal brads along the top of the helmet, and along each side to create a metal look to the helmet. 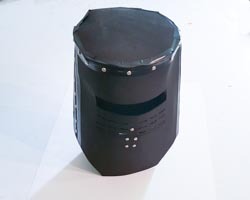 I studied the real photo of the black knight helmet closely, to get the placement right. 5. 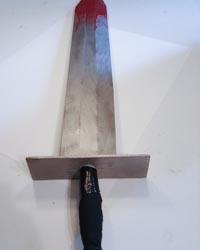 My husband made the sword out of a scrap piece of wood we had, which was 6 inch wide by about 1 inch thick. This is much wider blade than the black knight actually had in the movie, but the large sword was a lot of fun to carry around. He spray painted it silver for me, then I sprayed the tip of the sword with red spray paint and allowed it to drip to look like blood. 6. That's it! You are ready to block and defend - "None Shall Pass!"